The Chelsea 500 Committee, consisting of local organizations such as the Chelsea Collaborative, TND, the Chelsea Housing Authority, the Chelsea Recreation and Cultural Affairs Division, and Bunker Hill Community College, will hold a Career Fair on Dec. 14 at Chelsea City Hall. The newly formed committee is working collectively to create a jobs pathway for Chelsea residents with Encore Boston Harbor, the $2.6 billion casino and resort that will open in June, 2019, in Everett. The committee is working on holding jobs pipeline information sessions, career readiness workshops, case management, interview skills workshops, ESL, computer classes and much more. All members of the community interested in working at Encore Boston Harbor are encouraged to participate in the various workshops and classes. The “500” portion of the Chelsea 500 Committee’s name represents the committee’s hopes to create a workforce pipeline so that 500 or more residents can gain the skills and support necessary to apply for positions at Encore Boston Harbor. While Chelsea 500 focuses on the opening of the casino, its longer-term ambition is to build a local workforce development capacity, along with advocacy and job readiness services, to improve Chelsea residents’ chances of securing employment in the near term. Building relationships with businesses in other hospitality-related industries is another goal for the committee. Chelsea 500 will collaborate with the Casino Action Network, One Everett, Somerville, Boston, and the MassHire Metro North Workforce Board. (Chelsea 500, MassHire and Encore Boston Harbor will host an information session on Nov. 13 at 6 p.m. at the Mary C. Burke Complex. For more information, please call Sylvia Ramirez at 617-889-6080). A new function hall is slated to open at the site of the former Polish American Veterans Hall at 35 Fourth Street. At its most recent meeting, the licensing commission approved restaurant and entertainment licenses for the proposed hall. The applicant, Emiliana Fiesta, LLC, also applied for a wine and beer license, but will have to wait until there is an available license in the city. However, one-day liquor licenses can be granted for the weddings, birthday parties, and other functions planned for the facility. The Polish American hall had a capacity of over 500 occupants for the two floors of the building. But based on concerns voiced by police officials, the licensing commission approved the restaurant license with a capacity of 250 occupants, limiting the functions to one level of the building, while the basement level can only be used for storage and kitchen purposes. The owners will also install licenses at all entrances on both floors of the building. 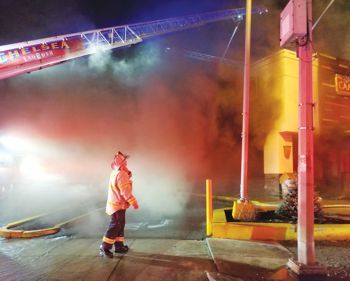 Even with the limitations on use, police Captain Keith Houghton said he was wary that the use of the building could tip from being a function hall to operating as a full-blown night club. “This is going to be a challenge,” said Houghton, who also requested that the opaque outside of the building be replaced with clear windows and that a floor plan be provided to police and the licensing committee. Broadway resident Paul Goodhue said he also had concerns about the proposal. Commission member Roseann Bongiovanni said she understood the concerns of the police and neighbors. “We do not want this to turn into a nightclub, that’s not an appropriate function,” she said. But with the proper conditions in place, Bongiovanni said the new owners of the building should have the chance to give the function hall a go. Licensing Commission Chairman James Guido also stipulated that live bands can perform during functions only and that for functions of over 100 people, a police detail should be requested. The approved hours for the function hall are 11 a.m. to 10 p.m. Mondays through Thursdays, 11 a.m. to midnight Fridays and Saturdays, and 11 a.m. to 11 p.m. on Sundays. Chelsea Cultural Council has received $21,900 from the Massachusetts Cultural Council (MCC) a state agency, to assist public projects that promote access, education, diversity and excellence in the arts, humanities and sciences. Council members will be available to discuss grant procedure and guidelines on Monday, September 24 from 2-6 p.m. in the lobby of the Williams Building, 180 Walnut Street. Organizations, schools, individuals are encouraged to apply for grant funds that can be used to support a variety of artistic and cultural projects that benefit citizens in Chelsea – including field trips, exhibits, festivals, short-term arts residencies or performances in schools as well as cultural workshops and lectures. Projects awarded must be implemented between January, 2019 and December 31, 2019. The deadline for completed Online Application must be received by October 15, 2018. Online Application is available at www.mass-culture.org/chelsea. Guidelines can be picked up at Chelsea City Hall, Dept. of Health & Human Services, Room 100 or find it at www.chelseama.gov/ccc. For additional information call (617) 466-4090 or email culturalcouncil@chelseama.gov. A state budget advocacy organization – Massachusetts Budget and Policy Center – has released a report this week detailing a five-year roadmap to fix the state’s education funding crisis – a plan that would require $888 million over five years and mean $21 million more in state funding per year for Chelsea Schools. Colin Jones of Mass Budget told the Record that the report – titled ‘Building an Education System that Works for Everyone: Funding Reforms to Help All Our Children Thrive’ – details a plan that would allow the state to increase school aid – specifically to communities like Chelsea Revere, and Everett – by around $200 million per year over a five-year period. That phased approach would lead to restoring what the 1993 education reform law promised, he said. Supt. Mary Bourque said the research confirms what the Chelsea Schools have been saying for quite some time. Jones said the formula fix needs to address the disparities between wealthy and poorer districts. Right now, he said Weston spends around $17,000 per student, while Chelsea Revere, and Everett are around $11,000 per student. He said it should be the other way around. He said the current formula requires districts to spend a set amount on teacher salaries, and in order to do that in the current funding climate, districts like Chelsea have to cut the extras, ask for City money or seek out grants. If that doesn’t happen, then it leads to cuts, bigger classes and no extras. Another byproduct is not being able to maintain school facilities properly. In Chelsea, the Foundation budget now is at $113 million, and state Chapter 70 education aid is $90 million. Under the new plan by Mass. Budget, by 2023, the school foundation budget would be $134 million and the state Chapter 70 aid would be $110 million. It’s a gain of some $21 million per year in aid that the Chelsea Schools have been calling for over the past several years. Jones said they consider their report a blueprint for fixing the statewide problem – a problem that is especially apparent in cities like Chelsea Everett, and Revere. He said he is hoping that it garners attention on Beacon Hill and becomes a point of discussion. The historic rotunda skylight above the circulation desk at the Chelsea Public Library has served for decades as a nice ceiling, but few knew that the elegant egg-shaped ceiling was designed to provide beautiful natural lighting to the striking entrance of the historic library. The rotunda above the foyer of the library was completed last Friday, June 15, and made a bright showing for patrons when the library opened on a sunny Monday. Library Director Sarah Jackson said the rotunda is one part of several small, but effective, renovations that have occurred in the last three years at the library – which had been showing its age severely when she took over three years ago. “The rotunda is original to the 1910 building, so that means it was 108 years old,” she said. “It certainly got its use, but it was time to replace it. The skylight is new and they re-built the entire structure off-site and moved it back on. It was one of the most extensive renovations that company has done. It was structurally deficient and leaked badly. There has been a tarp over it since I’ve been here. It lasted over 100 years and we decided to make it as historically accurate as possible, but with a modern look. 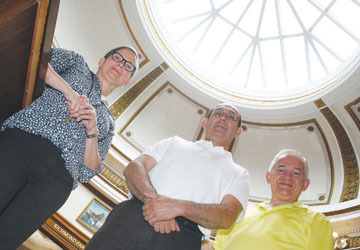 The rotunda was part of a five-year strategic plan for the building that Jackson wrote with her staff and the Library Trustees three years ago. Two years ago they began putting new carpeting in the areas most heavily traveled. Last year, they added more carpet and painted the reference and reading rooms, as well as putting in new lighting there. Additionally, by getting rid of some of the obsolete books, mostly in the reference section, they were able to create new space at the front of the library to make a Teen Section. There, they have included games, magazines and an area with new furniture for teens to hang out and read. Jackson said it all came together with very little money and was a way to make the old library new again. In addition to the great renovations, the library announced that it will be extending its hours to 8 p.m. on Mondays and Tuesdays through the summer. Previously, they were only open late on Tuesdays. On Dec. 22, at 5:20 p.m., officers responded to 165 Walnut St. for a report of a past armed robbery. Upon officers’ arrival, they made contact with the victim and alleged robbery suspect, standing out front of the building. The victim claims the suspect took $200 from him after he left the ATM at the Chelsea Bank on Broadway. The suspect claims the money was used to buy drugs from him and that the victim complained about the quality of the drugs purchased. Jose Rivera, 32, of 11 Congress Ave., was charged with unarmed robbery. On Dec. 22, at 10:49 p.m., officers were dispatched to the Spanish Falcon Club located at 158 Broadway on the report of a fight outside. Officers observed security outside speaking to a group of men, two of which appeared intoxicated. As Officers spoke to security, they were informed that the two intoxicated males had been causing a disturbance because security refused them entry due to their state of intoxication. They were asked to leave several times, but were becoming aggressive towards employees. As officers engaged the men in conversation, it was apparent that the men were upset at having been refused entry and wanted to continue their night of drinking. The two men refused the officers’ orders to leave the area and became loud and boisterous, causing a disturbance. The first male was placed into custody after violently resisting officers in their attempt to place him under arrest. The second male, and brother of the male taken into custody, refused orders to leave, and he also became aggressive and was taken into custody after a struggle. David Garcia, 24, of 141 Marlborough St., was charged with disorderly conduct. Kevin Garcia, 21, of Lynn, was charged with disorderly conduct, assault and battery on a police officer and resisting arrest. Lofts Gallery. Bailey was a resident of the Lofts for about two years before passing last year. 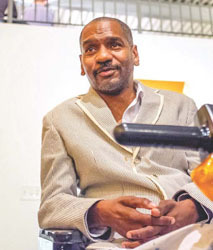 It’s only appropriate that Victor Bailey would close down the Spencer Lofts Gallery. The world-famous jazz musician, who passed away last year from complications related to MS/ALS, once lived at the Spencer Lofts while working as a bass professor at Berklee College of Music. After taking up art as well as music, he had a great collection of works that were expertly shown in the gallery when it re-opened two years ago. It drew a major crowd and was a highlight for the long-time gallery in the loft building. The fundraiser will benefit Bailey’s estate through the proceeds from the many works that remain in his family’s possession. Bailey’s paintings will be on display in the gallery and will be available for purchase. Proceeds will benefit the Victor Bailey Estate and the Berklee College of Music. The time will take place on Saturday, Dec. 9, from 4-8 p.m. in the Gallery at Spencer Lofts. Parking is available on site. Additionally, several of Bailey’s colleagues from Berklee will be on hand to play live jazz music throughout the evening – which will be a tribute to not only his music prowess, but also his artistic abilities. Born into a music family in Philadelphia in 1960, Bailey attended Berklee and launched a hugely successful jazz career, while also writing many well-known R&B songs for major artists. An accomplished bassist, Bailey was an Associate Professor of Bass at Berklee College of Music. He performed and recorded with Sonny Rollins, Lady Gaga, Miriam Makeba, Madonna, Mary J. Blige and many others during his long, notable career. He also recorded with Chelsea’s own Chick Corea from time to time. Bailey was the bassist in two of the most influential jazz-fusion groups: Weather Report (he replaced the legendary Jaco Pastorius) and Steps Ahead. Bailey drew up upon his jazz career for inspiration in his art career. DeVita said it will be a bittersweet evening for the Gallery though, as it is closing down for good. Though many Chelsea residents have treasured its contributions to the arts scene in the city, DeVita said many of the residents in the building are not interested anymore. The Gallery was a coup for Chelsea when the lofts were built more than a decade ago, one of the few arts locales in the City. Reception and admission to the Gallery are free and open to the public. The Victor Bailey Exhibit runs through December 31, 2017. Gallery hours by appointment. Accessible parking is available, as is on-street parking.